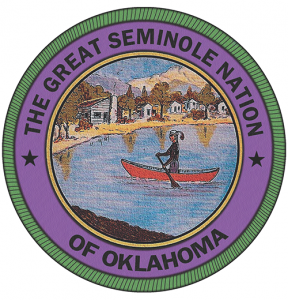 Seminole Nation of Oklahoma is comprised of three federally recognized tribes and independent groups with most living in Oklahoma and a few in Florida. The Seminole Tribal Jurisdiction Area is located in south-central Oklahoma and includes most of Seminole County. The Seminole Nation Tribal Complex is located in the town of Wewoka, Oklahoma. Wewoka is also the site of several Seminole Nation programs and services. The Mekusukey Mission, located just outside of Seminole, Oklahoma, houses tribal offices, recreational areas, industrial and commercial areas, and a cultural area. The history of the Seminole Nation of Oklahoma began when Spain first occupied the peninsula known as Florida. Tribes from three different basic language groups, the Timuquan, Calusan and Muskhogean occupied Florida and lived in small and well-organized villages. The Seminole were eventually removed to Indian Territory following the Treaty of Payne’s Landing in 1832. They were eventually granted a reservation, but after subsequent land cessations, these lands were allotted following the Seminole Agreement of 1909. Today, the tribe owns 372 acres of federal trust land and approximately 53 acres of fee simple land. An additional 35,443 allotted acres supplement the tribal land base. The Seminole name originated due to a European misnomer, which categorized a diverse group of autonomous tribes together under the name Seminole. The Spanish first recognized the indomitable original inhabitants of Florida, and called them cimarrones, or “free people” (Seminole). Translated through several languages to English, this term came to apply to all of Florida’s initial inhabitants, and their neighbors who later fled to join them when deprived of their own homelands. The Seminoles absorbed remnants of other Florida tribes into their own. The Oconee were the original “Seminole,” and later included the Hecete, Eufaula, Mikasuki, Horrewahle, Talahassee, Chiaha, and Appalachicola. Additionally, through intermarriage, traditional cultural adoption practices and treaty obligations, runaway and “freed” slaves were absorbed also. The term “cimarrones” was initially transliterated by the Creek as “semvlonÄ“.” “ SemvlonÄ“” but eventually morphed into “Semvnole” (pronounced sem-uh-no-lee) and thus we have the term that would describe the various Indian tribes in the State of Florida. Although a relatively large contingency of Seminole were able to hold out in the Florida Everglades during the Indian Removal Era and Seminole Wars, the majority were relocated to Indian Territory along with the other “Five Tribes” of the southeast. Today the Seminole Nation of Oklahoma is located in Seminole County, Oklahoma. The entire county of Seminole is a portion of the original Seminole Nation jurisdiction. The county is a checkerboard of tribal trust property, Indian allotments, restricted Indian lands, and dependent Indian communities. Native Americans make up 22% of the population of Seminole County. According to the Seminole Nation Tribal Enrollment Office the Seminole County service population comprises 5,315 Tribal citizens. The total enrollment of the Seminole Nation of Oklahoma is approximately 17,000 members. According to 2000 U.S. Census data for Seminole County the Native American (one race only) population is 4,328 and the Native American (one race or combination with other race) population is 5,485 respectively. Seminole Nation of Oklahoma is working to revive the use of the Creek language. The Seminole Nation Cultural Resources Department offers language classes to tribal members. They assert that their language is vital to the perpetuation of Seminole culture and as a gift from The Creator is responsible for preserving and developing for future generations.